But that’s just what happened with the bioengineers at the Harvard School of Engineering and Applied Sciences, as reported in the May 24 online edition of Nano Letters. The most common way of making nanofibers is to use a high voltage electric charge in droplets of the basic material (typically a polymer plastic). At a high enough charge the droplet erupts into a thin (nanoscale) stream and whipped by electrostatic repulsion into a fiber. The process, called electrospinning, works – but is difficult to control and tends to produce uneven results. 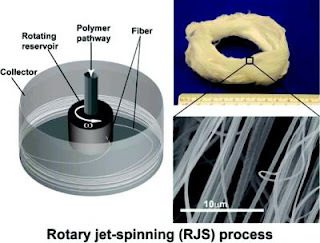 The Harvard solution uses a rotary jet spinner, very similar in technique to that used for creating cotton candy. It’s a mechanical process and doesn’t require the use of high voltage equipment. Better still, it’s much more easily controlled. Like the production of cotton candy, the use of a jet nozzle (density and diameter control) and a spinning collector (uniformity, shape and diameter control) can work with a range of natural and synthetic polymers to produce a high degree of flexibility in the diameter of the fibers and their alignment. The texture of the fibers can also be varied from smooth to beaded. There is even some ability to produce artificial structures, something like a three-dimensional weave that can be used as the basis of body tissue. This ‘shaping’ aspect of the technique has drawn the attention of medical researchers, who are using the nanofibers as tissue scaffolding (superstructure) in experiments with growing heart muscle from rats. Well, perhaps not everyone can do it, but the technique has obvious advantages. Nanofibers, like other nano-shapes such as nanotubes and nanoparticles are proving to have a wide variety of applications. What will make these applications commonplace will be the production techniques that provide the right kind of control and the ability to ‘scale’ – produce at higher volume. Mohammad Reza Badrossamay is the lead author, along with Kit Parker, Disease Biophysics Group at the Harvard School of Engineering and Applied Sciences, Holly Alice McIlwee; bioengineering graduate student at SEAS, and Josue A. Goss, the DBG laboratory manager who built the machine with Badrossamay.